Depression and anxiety are under-recognised by health professionals, partly because some of the symptoms, such as fatigue, poor sleep, poor appetite and palpitations, may be attributed to cardiac disease and are difficult to distinguish from the usual worry associated with serious disease. Screening for symptoms using a validated tool for the setting is advocated to improve recognition of these problems[#freedland-ke-carney-rm-rich-mw.-2011] and supports patient referral for full assessment and management by appropriate health professionals. There is some evidence that in addition to reducing distress, management may reduce future cardiac events and costs of care. There are several questionnaires available to assess the presence of symptoms for depression including the Beck Depression Inventory,[#beck-a-ward-c-mendelson-m-et-al.-1961] the Cardiac Depression Scale[#hare-dl-davis-cr.-1996] and the Hospital Anxiety and Depression Scale. [#zigmond-as-snaith-rp.-1983] The questionnaire used may be dependent on the agency providing the service. The following steps have been recommended by a number of groups on the American Heart Association Prevention Committee and have been endorsed by the American Psychiatric Association as shown in the figure below.[#lichtman-jh-bigger-jt-blumenthal-ja-et-al.-2008]. Repeated measurement of depression is recommended by the current Australian guidelines [#colquhoun-dm-bunker-sj-clarke-dm-et-al] to assist in identification of trajectories of depression symptoms. Over the past 2 weeks, have you often been bothered by any of the following? 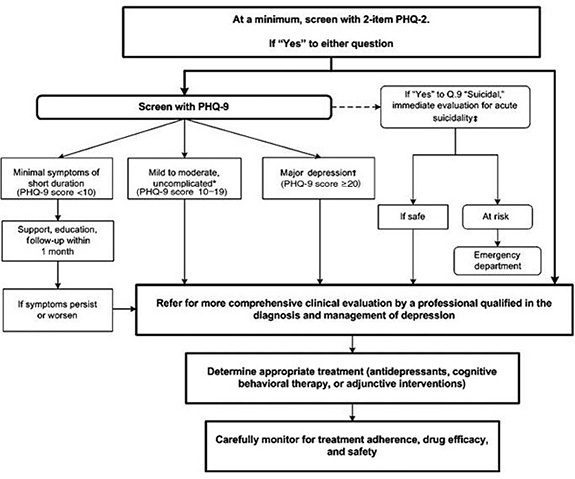 If the answer is ‘Yes’ to either question, then refer for clinical evaluation by a professional qualified in the diagnosis and management of depression, or screen using PHQ-9. The Patient Health Questionnaire-9 (PHQ-9) and instruction manual that explains scoring and interpretation is available from phqscreeners.com. N.B. Be aware that the final item in the Patient Health Questionnaire (PHQ) 9 asks patients whether they have “thoughts that they would be better off dead or hurting themselves in some way”. Patients responding positively to this item require immediate risk assessment in line with organisational protocols. Where a formal diagnosis is not required or available, ask about symptom patterns of various depression disorders (see www.behavenet.com). The impairment caused by anxiety can be profound, so it is important to identify high levels of anxiety and to refer affected patients to appropriate mental health professionals. The GAD-7 questionnaire can be used to assess for GAD. The instruction manual explains scoring and interpretation. Where a formal anxiety diagnosis is not required or available, ask about symptom patterns of various anxiety disorders. Further information is available from www.behavenet.com/anxiety-disorders#301. At the simplest level, ask the individual or a significant other about the patient's general levels of anger. However, if you sense that anger may be a significant problem, consider using a questionnaire. Most research validated questionnaires for use with cardiac patients charge a fee to access. However, a simple and cheap option is the online Aggression Questionnaire which measures physical aggression, verbal aggression, hostility and anger and allows the respondent to compare scores with the average male or female. The risk of suicide is an important consideration in anyone with a mental disorder, as up to 90% of people who commit suicide had suffered from a diagnosable mental disorder. Males and those over 75 years of age have a higher suicide risk. For further details see www.cdc.gov/violenceprevention/suicide/index.html. Useful screening tools are the Primary Care PTSD Screen and the Assessing PTSD screen. Beck A, Ward C, Mendelson M, et al. An inventory for measuring depression. Arch Gen Psychiatry 1961;4:561-571. Lichtman JH, Bigger JT, Blumenthal JA, et al. Depression and Coronary Heart Disease. Recommendations for Screening, Referral, and Treatment: A Science Advisory From the American Heart Association Prevention Committee of the Council on Cardiovascular Nursing, Council on Clinical Cardiology, Council on Epidemiology and Prevention, and Interdisciplinary Council on Quality of Care and Outcomes Research: Endorsed by the American Psychiatric Association. Circulation 2008;118:1768-1775. Bonnet F, Irving K, Terra J, et al. Anxiety and depression are associated with unhealthy lifestyle in patients at risk of cardiovascular disease. Atherosclerosis 2005;178:339-344. Luyster FS, Hughes JW, Gunstad J. Depression and anxiety symptoms are associated with reduced dietary adherence in heart failure patients treated with an implantable cardioverter defibrillator. J Cardiovascular Nursing 2009;24:10-17. Gander M, von Känel R. Myocardial infarction and post-traumatic stress disorder: frequency, outcome, and atherosclerotic mechanisms. Eur J Cardiovasc Prev Rehabil 2006;13: 165-172. American Psychiatric Association. Diagnostic and statistical manual of mental disorders (5th ed.). Arlington, VA: American Psychiatric Press, 2013.